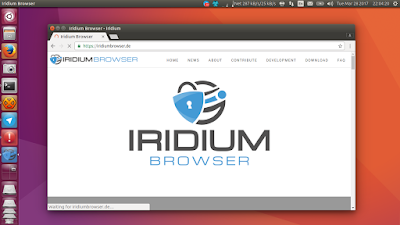 Iridium is a Chromium-based browser that focused on privacy and security. It disabled many Google features/services by default (e.g. changing the search to Qwant), block third-party cookies, added more latest technologies (like WebRTC), with more security enhancements. It's an entry on FSF Directory that replace Chromium. It's officially available for GNU/Linux (Ubuntu & openSUSE), Mac OS X, and Windows. Here how to install Iridium on Ubuntu. Do $ sudo apt-get update command line to introduce your system to new repo. Do $ sudo apt-get install iridium-browser to download the browser & install it. At March 29th I got version 54 with 55MB of download. Now, Iridium Browser icon should be available on your desktop menu.